A Pakistani Shia leader has warned that the public and the government should be made aware of the “dangers” posed by Baha’is and Ahmadis. Shia cleric Allama Iqbal Bahishti urged the Government to be watchful of the ‘heretic’ Baha’is & Ahmadis. 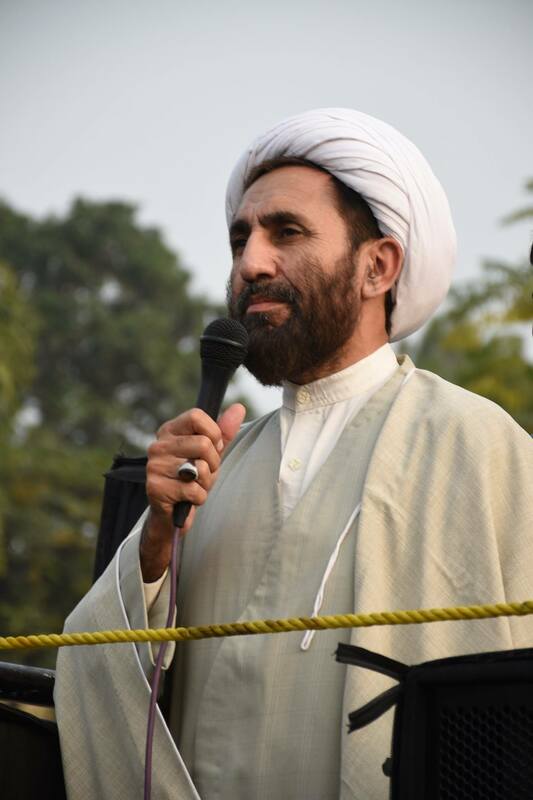 Allam Iqbal Bahishti who is the provincial secretary-general of Pakistan’s largest Shiite political organization the Majlis Wahdat-e-Muslimeen (MWM) made the comments while speaking to members of the press on November 11. The Islamic world was split into two groups, Sunnis, and Shiites but the colonial powers very cleverly planned the foundation of four fraudulent religions, for two of which they chose the Arab world and for the other two they chose the non-Arab [Persian] world. Then from these regions, prominent personalities were selected to lead those faiths. Thes superpowers conspired against Islam in the 18th century and laid the foundation of fraudulent and heretic faiths.From these four faiths, Wahabism quickly gained popularity and so did Qadianiat [Ahmadiyya]. However, the heretic faiths failed to gain any ground in the Shia world and the reason for this was the countermeasures by the Shia community. He described Bahai and other faiths as heretics and said the colonial powers are scared of Islam and hence use these individuals to gain their objectives and the biggest obstacle that they face is Islam. He further added that even though the public was aware of the dangers posed by Ahmadis, the Shia Muslims need to do more to raise awareness about the dangers posed by Baha’is in the country. In Pakistan, there is a great deal of awareness of against Qadiyaniyat [Ahmadis]. After defeat in Iran, the Bahais directed their focus towards South Asia and Europe. The ideological center of the Bahais is in the city of Haifa which is located in the Zionist state of Israel. Bahis are more dangerous than the last three heretic faiths. The Bahais have dozens of small centers from the Northern areas to Karachi in the south. It is very important that the public, as well as authorities including the interior ministry and the religious department, should be made aware of the danger of these beliefs. The MWM follows the Ayatollah, the supreme leader of Shias based in Iran. Shia regime of Iran has long persecuted its Baha’i citizens, Since the 1979 revolution the Baha’is have faced systematic persecution and suffered widespread discrimination solely for believing in a faith that is not officially recognized by the Iranian Constitution. Similarly, the Ahmadiyya Muslims have also faced severe persecution at the hands of Pakistani authorities. In 1974 Pakistan amended its constitution to declare the Ahmadi ‘non-Muslim’. Majority of Sunnis and Shiites consider the Ahmadis apostates due to which they are a target of sectarian attacks. Many Ahmadis continue to serve prison terms of the blasphemy including the crime of keeping copies of the Quran. It took Jews 300 years to realize the truthfulness of Jesus Christ who was Messiah for religion brought by Moses. Then came the mass conversion today know as Christians. Ahmadiyya founder claimed to be the Messiah for Muslims and prophesied with in 300 years majority will realize His truthfulness by accepting Ahmadiyya as true Islam. To His claim127 years have already passed and probably one is aught to listen such clerics for another 100 or 150 years. @ Zubair.. hopefully Allah bless you to believe in Ahmadiyyah’s founder. I could not believe that extremist Shiah’s clerics are so hate with other belief such as Ahmadiyyah and Bahai sm. Whereas our prophet has warned his followers: if there is some one who divides Muslim or Islam, it is not your responsible, only Allah know who the true faith or wrong faith. Extremist Muslim ( sunni and Shsih) are dangerous faith in global society.. .. Allah will be destroyed both extremist severely as we see in Iraq, Syria, Libanon. Then, in their wake, We followed them up with (others of) Our Messengers: We sent after them ‘Isa the son of Maryam, and bestowed on him the Gospel; and We ordained in the hearts of those who followed him Love,or Compassion and Mercy. Q.57;27. And in their footsteps We sent Jesus the son of Mary, confirming the law that had come before him: We sent him the Gospel: therein was guidance and light, and confirmation of the law that had come before him: a guidance and an admonition to those who fear Allah. (taqwa) Q.5;46. Behold! Allah said: “O Jesus! I will take thee and raise thee to Myself and clear thee (of the falsehoods) of those who blaspheme; I will make those who follow thee SUPERIOR to those who reject Faith, to the Day of Resurrection; then shall ye all return unto Me, and I will judge between you of the matters wherein ye dispute. Q.3;55. Proverbs 25:21 If your enemy is hungry, give him food to eat; if he is thirsty, give him water to drink. (Laviticus 19:33). Do not mistreat or oppress a foreigner in living in your country, love them as you love self. Remember that you were foreigner in Egypt”. Jews and Christians who follow these teaching become a lovely Jews& Christian, tolerant, love each other, and no hatred. So Jews and Christian are Muslim Brothers. Muslim, Jews and Christian should love, respect each other. Unfortunately those who do not read and practice Moses& Jesus’s teaching will not get love, or compassion, mercy and guidance from Allah (swt). Their heart will be filled by hatred or satan, then they will do what satan ask them to do. Satan is against what Allah ask people to do. Satan wants people go to hell with him by doing violence, talking slander, backbiting and being rude to people. That is why Extremist Muslims hate Jews, Christian and hostile toward them till today. Extremist Muslim follow some violent Verses of Al Quran and some violent Hadith. So those Muslim who follow violent verses and hadith will become extremist Muslim and the terrorist or Jihadith.